Our Documentation Assistant Lucy Stock is here to talk about some colourful finds from our current digitisation project! Hello to all, and a happy 2019! I hope the new year will bring you many great experiences. To kick things off, how do you fancy a sneak peek at some of the fabulous new textile images which we’ve produced as part of our on-going digitisation project? When our new and improved catalogue goes live this year, we’ll be populating it with more and more images. Jpegs, such as those used in this blog, will be free for anyone to download. You’ll also be able to order each image as a higher resolution tiff for use in publications etc. The digitisation project is the result of hard work stretching back over several years. I joined the team as Documentation Assistant a year ago. I plan the day-to-day project management and planning of the digitisation. In October, photographer Patrick Jameson was appointed, and shortly after, with the help of Support Assistants Rowan Campbell and Tilly Heydon, the digitisation began. We started with the photography of our extensive textile collections. We’ve had a really fulfilling few months. Naturally there was a period of finding our feet (bare or socked feet – no mucky shoes near our textiles!) but we soon got into the swing of things and have well over 820 new photographs to add to the catalogue. This silk mosaic is the creation of Lucienne Day. Day works in Thai and Indian silk. Each rectangle is an individual silk tile, and each catches the light differently as you move around it. It is a vibrant piece with a dynamic quality. It may sound cliché, but this photograph really does capture a fleeting moment. This is a good time for me to remind you that even a beautiful photograph is not a substitution for seeing art like this in person. Come and visit us! You may have already seen a detail shot of these curtains on our catalogue, but we have now digitised each curtain and pelmet individually, including their window facing sides. We don’t know very much at all about these beautiful pieces, but traces of their past lives show through the sun damage they gained whilst hanging. It is possible to see where the window ended, and where the frame blocked the sun. These curtain linings have become artworks in their own rights. I couldn’t resist the opportunity to show you this tweed cap, by Agnes Miller Parker. Look closely – it harbours a secret…Within a sealed clear pocket on the inside of the cap is a wood engraving of two cats (‘Minnie and Jeannie’). The cap comes with a matching tweed motoring coat and dates from c.1920 – 1930. This dress was worn by Catherine Cranston, who was responsible for commissioning Mackintosh to design the Willow Tea Rooms in Glasgow. It dates from somewhere between 1900-1910. When we came to digitise this item, we quickly realised that it was exceptionally fragile. The silk showed widespread splitting. A plastic pocket accompanying the dress contained pieces of the fabric which had previously become detached. In the early twentieth century, silk was sometimes “weighted”. The silk (sold by weight) was treated with metallic salts. Weighted silk garments had more bulk, rustle – appeared more luxurious. However, the weighting process is detrimental to the fabric and ultimately leaves the silk ‘shattered’. Perhaps this explains the fragility of Miss Cranston’s dress? We were able to remove the more manageable over-layer from its box for a capture, but we drew the line when it came to the underskirt. Leaving it in its housing, we instead asked Patrick to take some detail shots of the fabric. If you do wish to see a full shot of this dress, however, you can – modelled by Miss Cranston herself. The photograph can be viewed by following the link from our catalogue here. This Hebridean village scene was designed by Eric Loundsbach and produced by primary and secondary school children. Here we can see the paper plan followed by the final textile piece (which is roughly twice as big). It’s a fun piece – like a sampler, it shows how different stitches can be used to great effect. The piece featured in a publication of the Needlework Development Scheme which you can read more about here. 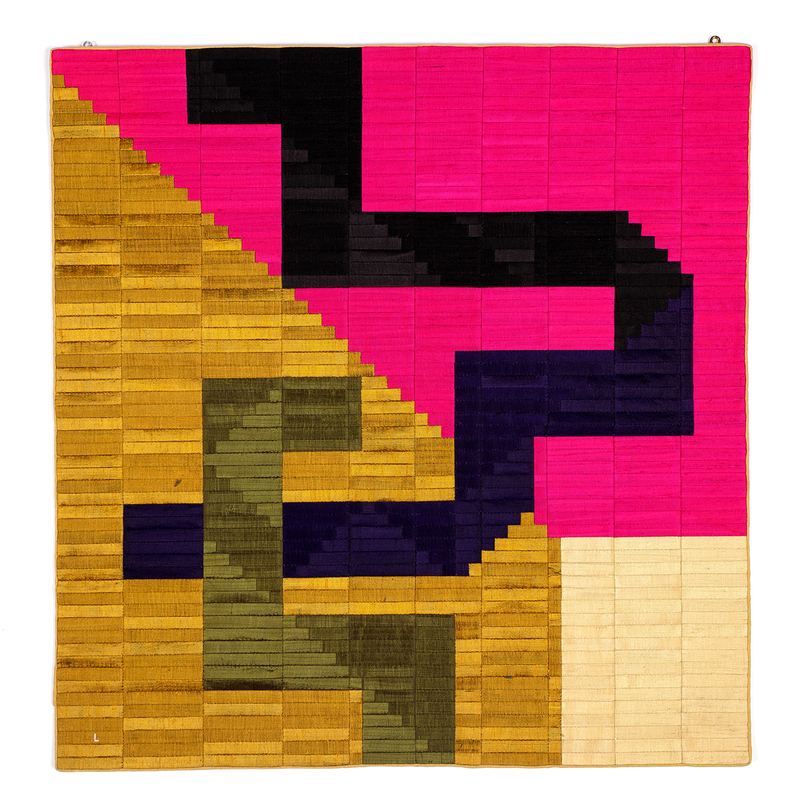 ‘Buildings in Embroidery – NDS Bulletin 34’ examines this piece and explains how similar works might be created. This publication, and others relating to the Needlework Development Scheme, can also be found in our collections here.